Discover Aloe vera juice benefits! Aloe vera juice is made by liquefying Aloe vera pulp. The cactus-like, perennial, aloe plant has thick, fleshy, leaves, with sharp pointed and spiny edges. Its flowers vary in color from red, orange, yellow or pink. 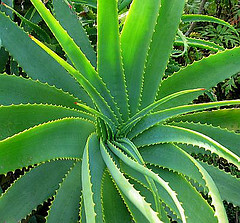 Historically, Aloe vera has been used as an alternative medicine and first aid. It has been used orally or topically. Aloe vera comes in different forms: capsule, pill, gel, oil and juice. Aloe gel is made by adding thickener to Aloe juice. Aloe oil is oil soluble portions extracted from the plant, into a vegetable oil. Aloe vera juice, gel or oil are used in commercial and homemade beauty products including: soaps, lotions, sunscreens, shampoos and cosmetics. It is found in other household products, as well, such as facial tissues. Aloe vera has a variety of uses but, here, we'll focus on skin care. Aloe vera is rich in vitamins and minerals, with antioxidants benefits! Vitamins A, C and E protect skin against damaging free radicals. Its B12 vitamin maintains blood and nerve cells. Its enzyme, Bradykinase, reduces skin inflammation. The percentage of Aloe vera in homemade skin care or commercial products varies greatly. Some creams or lotions may have approximately 0.5% while others may contain 70%. When making homemade soap bars, replace some water with Aloe vera gel or juice. Add your favorite fragrance or leave your soap unscented. To make Aloe vera homemade liquid soaps add Aloe gel or oil to liquid castile soap. Check your homemade soap recipes. Also, use Aloe vera in homemade lotion to soothe dry, chapped, or flaky skin. It's excellent for eczema or psoriasis sufferers! CAUTION! Aloe vera gel and juice are highly perishable. They should only be used in cosmetics that are quickly, used. Use in cosmetic or skin care products with a high percentage of soap, glycerin, alcohol or other preservative. CAUTION! Aloe vera may produce side affects. Do not apply to deep cuts, wounds or severe burns. Do not use high doses. Do not use long term. Aloe gel should be free of athraquinones, (aloin), that can irritate the gastrointestinal tract. If you're allergic to garlic, onions or tulips than you're likely allergic to Aloe vera too. If in doubt, apply a tiny amount to inside of arm then cover with a bandage for 24 hours. Afterwards, check for any skin reaction. If skin is irritated, avoid Aloe vera in your skin care products, including household products such as facial tissues.